The RYA Coastal Skipper practical course is designed to teach you to safely and confidently take on longer passages during day AND night. It is a step up from Day Skipper as you need now to deepen and strengthen your passage planning skills. The course puts increased focus on the planning and execution of longer passages further away from shore. Passage planning, navigation, pilotage, weather forecasting, victualling are some of the key focus topics. But also engine maintenance, sail selection and handling, reefing under way and watch keeping. Your experienced and patient instructor will teach you these skills and you will put them into practice as you skipper the yacht on longer passages among the Croatian Islands. 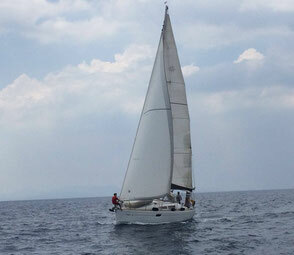 During the course you will also refresh mooring and anchoring under various conditions. You will live aboard for the duration of the course and visit many different harbours and anchorages where you will spend the night. You will also complete at least 4 night hours sailing. This is to practice night pilotage and get used to identify lights and buoys at night and navigate without the use of electronic navigational aids. With a maximum of 5 students per yacht, your instructors can devote plenty of time to your needs and focus the program to the areas you need most. At the end of the RYA Coastal Skipper course you will be confident to skipper a cruising yacht on longer passages by day and night. Students who successfully complete the Coastal Skipper course are awarded the RYA Coastal Skipper practical course completion certificate and can charter a yacht pretty much everywhere in the world. - Can plan a coastal passage considering the yacht capabilities, navigation, victualling, weather. But also ports of refuge, tidal heights and tidal streams, publications required and strategy. - Can prepare a pilotage plan, with consideration of surroundings, transits, clearing bearings, buoyage, port or harbour regulations and tidal considerations.